Sometimes, the food blog world kind of feels like an exclusive club. Don’t take that the wrong way, we’re not saying that us bloggers and self-proclaimed “foodies” are snobs and won’t let anyone else into our club or anything- as a matter-of-fact, it’s quite the opposite. We love it when other people read our blogs and we always get excited when people tell us they’ve made our recipes! We spend lots of time trying to encourage everyone to give our recipes a try. But the problem is that so often our recipes aren’t always doable by the general public. Because let’s be real, here- how many people do you know who keeps things like coconut flour, nutritional yeast, xanthan gum, butter extract, peanut flour, stevia, and date paste stocked in their pantries and fridges? Unless you have at least one foodie friend, probably no one. Over the past week this was brought to our attention. While our recipes may look delicious, we were told by some people (in a completely friendly way) that they want to make some of them, but when they look at the ingredient list they have no idea what half of the stuff is, and it scares them off. Basically, our recipes are so often geared toward the food-blogging crowd. People who aren’t deterred by unconventional ingredients and are willing to go to every random health food store in the city looking for one specific item. But don’t you think we should make our content more accessible to the general public? Isn’t the purpose of writing a healthy food blog to get people in the kitchen cooking healthy food? Which is why we have decided to start a new weekly feature- “Simple Sundays”. We’re not going to stop using all the random ingredients we’re accustomed to buying (and off the record, most of the stuff we get can actually be found at No Frills or the Bulk Barn), but at least one day a week (aka-Sunday) we’re going to post a recipe that requires minimal ingredients, all easy-to-find and recognizable to the general public, and is very simple to make. So to kick things off with our first official “Simple Sunday”, we decided to make you a snack! 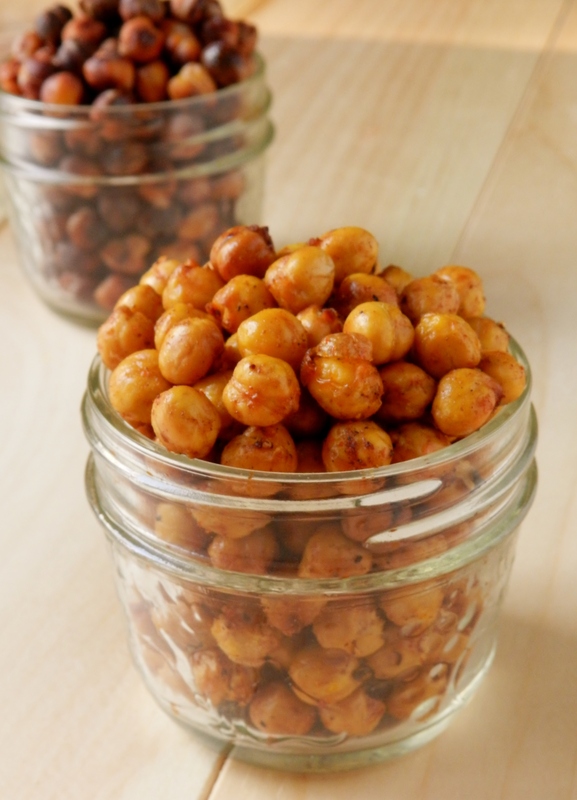 And what is simpler than roasted chickpeas! Maple and cinnamon! There is no sugar added to these, (aside from the sugar in maple syrup) and no oil. Just pure crunchy goodness! 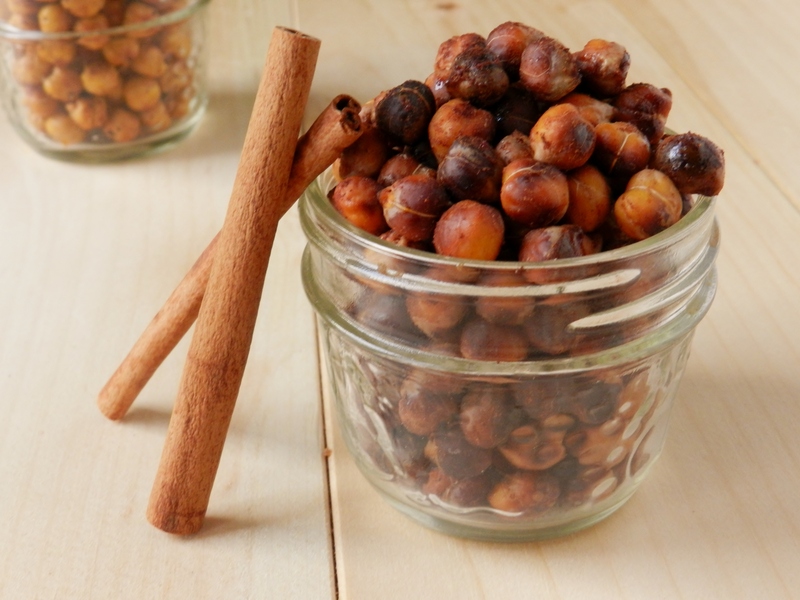 But there are a lot of other reasons why this recipe is an excellent snacking option, and that’s all thanks to the chickpeas! Chickpeas are very high in fibre, a great source of protein (not a complete protein, but if you’re eating a balanced diet you should have no problem getting all the amino acids required to make complete proteins) low in fat, sodium, and of course have no added preservatives or chemicals, so you can munch happily knowing everything that’s in your food! Pat the chickpeas with a towel to soak up the excess water. Place them in a bowl and toss them with the maple syrup and cinnamon. Line a large baking sheet with aluminum foil (shiny side down) and spread the chickpeas over it. Bake in the oven for 30 minutes, stirring every 5 or 10 minutes, until the chickpeas are crispy and browned. (don’t worry if some of them start looking a little bit black) Allow to cool completely, them place them in an air-tight container and store in the pantry for up to 2 weeks. **this recipe can easily be doubled! 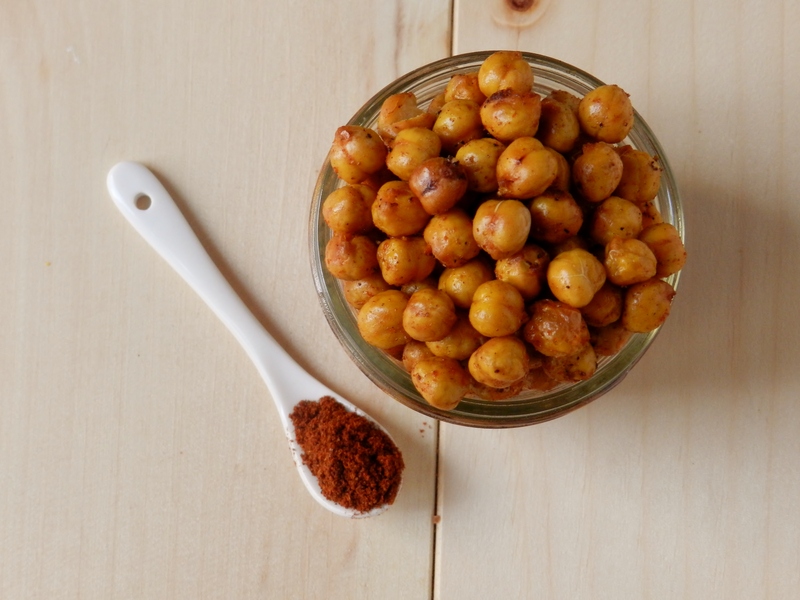 And now on to the savoury ones: chili chickpeas! So if you’re the kind of guy (or gal!) who doesn’t have much of a sweet tooth, these are probably right up your alley! If sensible snacking has been your Achilles heal, we strongly encourage you to give these a try! 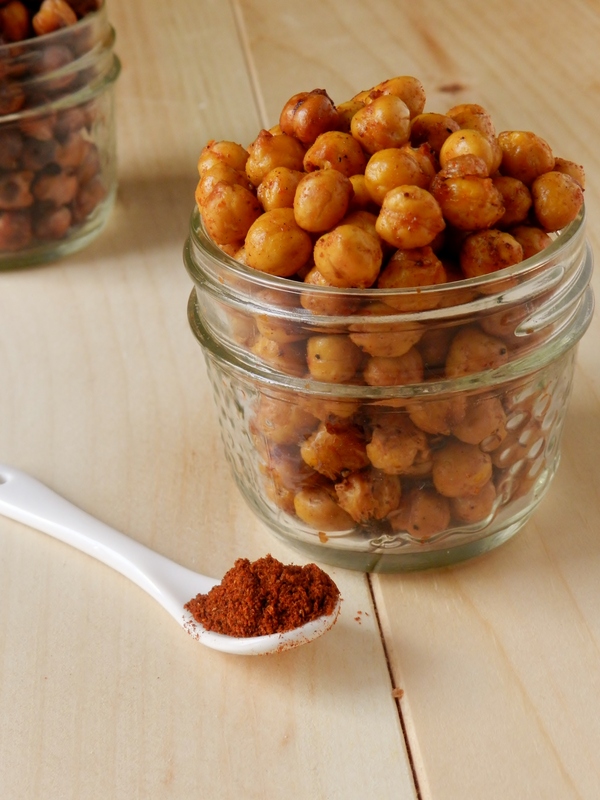 Even if you’ve never eaten chickpeas- we promise you won’t be disappointed! And if you don’t particularly enjoy spending lots of time in the kitchen, you can make a double batch and then you’ll have enough to last you for at least a week (depending on how quickly you eat them but we give you fair warning: these are addictive!). Preheat the oven to 400F. 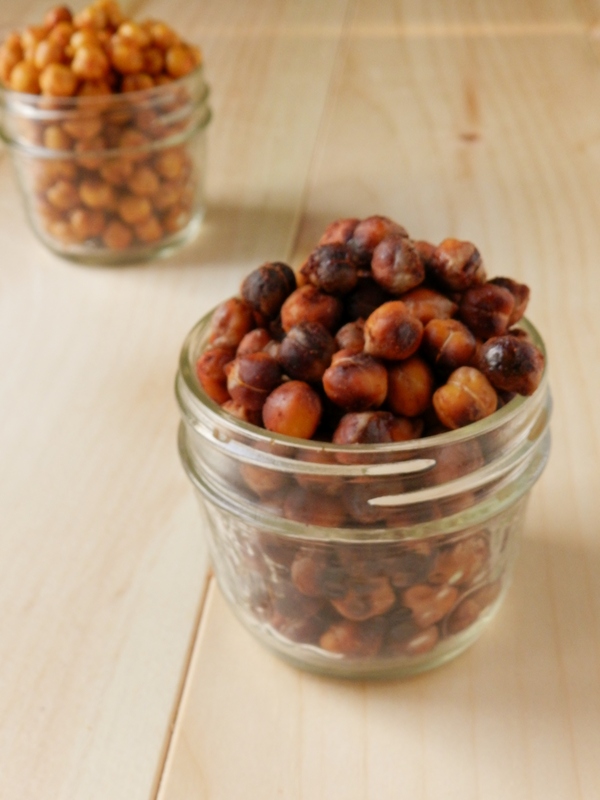 Pat the chickpeas dry with a towel, and place them in a bowl. Toss them with the olive oil and the spices. Line a large baking sheet with aluminum foil (shiny side down) and spread the chickpeas across the sheet. Bake for 30 minutes, stirring every 5 or 10 minutes, until they are browned and crispy. (Don’t worry if a few of them become slightly charred-looking) Allow to cool completely, then store them in an air-tight container and keep them in the pantry for up to 2 weeks. 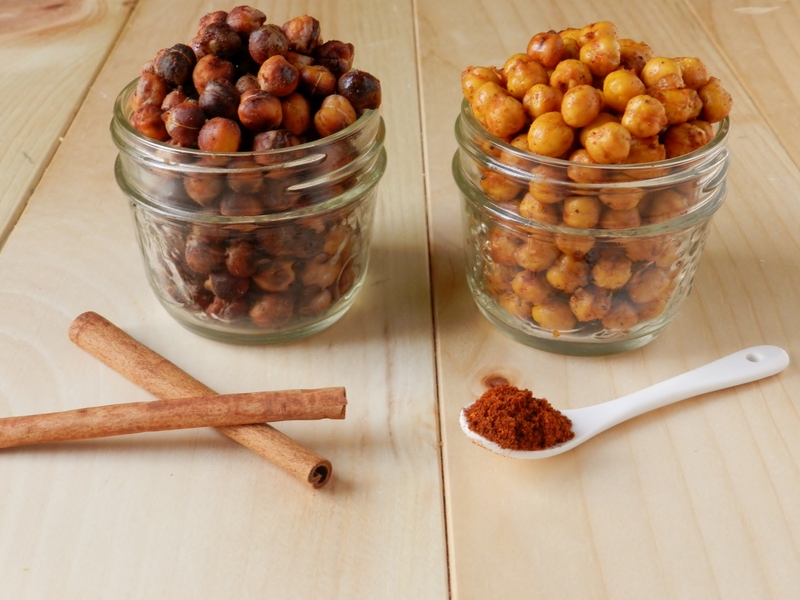 Posted in Uncategorized and tagged chickpeas, chili, chili chickpeas, cinnamon, easy, food, health food store, healthy, high fibre, low fat, maple, maple cinnamon, nutritional yeast, paprika, peanut flour, protein, roasted chickpeas, simple, simple sunday, snack, sugar-free, vegetarian. Bookmark the permalink. Both of these recipes look delicious and I will try them both. Keep up the good work girls! What a great idea girls! I’ve roasted chickpeas plenty of times, but mine are always savoury. I never thought of pairing the healthy protein source with cinnamon and maple syrup. Guess I have a new activity to try today! 🙂 Even as a Foodie, I don’t always keep every ingredient on hand (BTW do you get your Xanthum Gum at Bulk Barn? I’m unable to locate it anywhere but there and am running out) so it’s nice that you are simplying a few ideas!